It’s 6:30 a.m. The snow-capped Tantalus Range to the west is bathed is warm orange light from the rising summer solstice sun. Towering over me to the east in the dark shadows and rising out of Howe Sound is the contrasting coldness of the 2,200-foot granite monolith of the Stawamus Chief. I lean over standup paddleboards on the expansive low-tide beach, attaching fins and leashes, glassy green water undisturbed in front of me. A few vehicles trickle toward the beach. Occupants emerge, clutching their coffee mugs and rummaging for paddles and PFDs. Our commute is about to begin. Yes, we’ll also stop for another coffee on our journey south, but our tranquil experience getting there is in stark contrast to the stream of the thousands of vehicles that pass under the vertical walls of the Chief ferrying their occupants on the daily commute on the Sea to Sky Highway to jobs in Vancouver. Our group of 10 wades into the glacier-fed fiord. Then onto our boards, gently dipping paddles into the green water, we propel ourselves silently. Words are still few. We soak up our incredible surroundings. Seals curiously pop their heads up around us. Shannon Falls thunders as it releases its cascading waters into Howe Sound. As we glide along in the centre of the sound, the sun’s warmth on our backs signals the start of another great Squamish day. A fishing boat chugs by us, and we take advantage of a free ride in its wake. In a few hours, the predictable Squamish outflow winds will transform the waters on which we are now into a into a playground of whitecaps for kiteboarders and windsurfers. We pass Watts Point, about half-way into our morning commute and hug the eastern cliffy shoreline. In places, we see ancient petroglyphs. 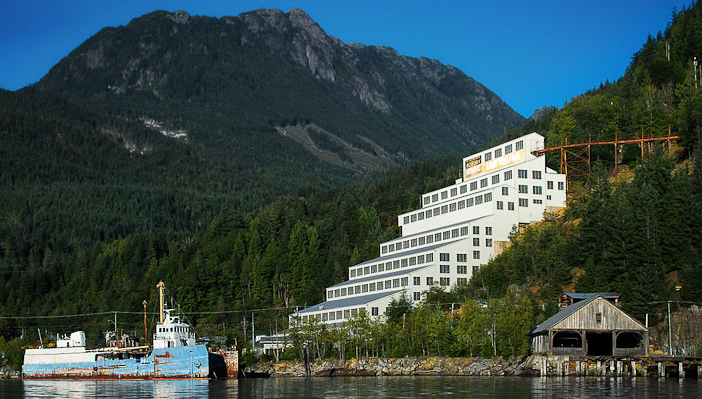 We round another point and the historic mining town of Britannia Beach and its iconic concentrator building appears in the distance. Britannia Mines concentrator. Photo by Anton Bielousov. Blood now flowing faster and senses awakened, we make a more spirited push. After six miles of paddling, it’s time for another coffee as Galileo Coffee comes into view. 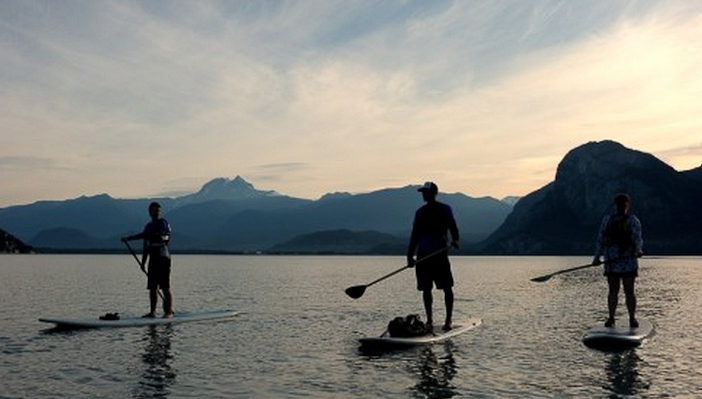 Welcome to StandUp4Coffee, the Squamish version of the morning commute. We hit the beach and then cross the highway carrying 12-foot boards to the amazement of the motorists either heading to their jobs in the city or venturing north to adventures in Squamish and Whistler. StandUp4Coffee is a weekly SUP outing, the brainchild of Norm Hann, better known for his conservation campaign StandUp4GreatBear, which is committed to the awareness and protection of the wildlife and cultures of the B.C. 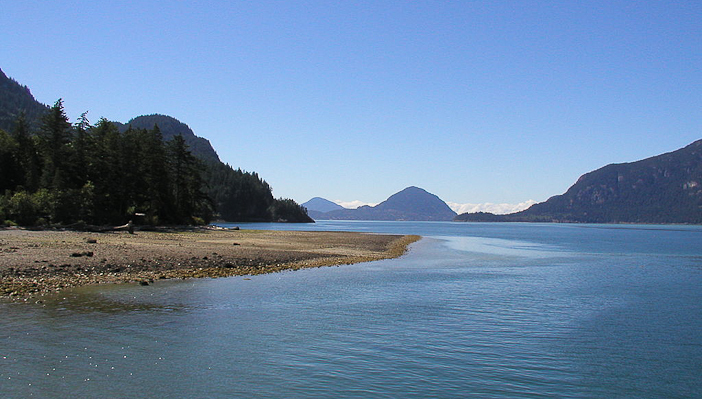 North Coast’s Great Bear Rainforest, one of the most incredible marine and terrestrial ecosystems found anywhere in the world. So thanks to Norm and the cooperation of Galileo Coffee and its amazing roaster/co-owner Lance McClure —who likes to also do the SUP commute back to Squamish later in the day for a downwinder paddle—for spearheading StandUp4Coffee. Galileo Coffee is a favorite stop for the outdoor adventure crowd, offering sumptuous homemade breakfasts, lunches and baked goods. With a second location at the Squamish Adventure Centre, just steps away from the Smoke Bluffs rock climbing area, you don’t necessarily need to paddle to get your fix. This article originally appeared on the Outdoor Research Veriticulture blog.